Those of us who spend a lot of time with horses will often describe a “special feeling” that we get in their company. The descriptive words/phrases used vary but speak to the peace to be found with our four-legged friends; horses are beings which “live in the moment” and we find ourselves doing the same when we are with them. 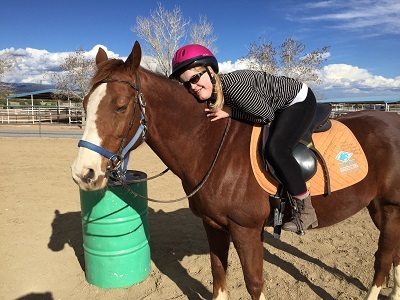 NMCTR volunteers can attest to the “magic” that happens between our horses and our clients during riding sessions. Recent studies conducted by the Institute of HeartMath provide a clue to explain the bidirectional “healing” that happens when we are near horses. According to researchers, the heart has a larger electromagnetic field and higher level of intelligence than the brain: A magnetometer can measure the heart’s energy field radiating up to 8 to10 feet around the human body. While this is certainly significant it is perhaps more impressive that the electromagnetic field projected by the horse’s heart is five times larger than the human one (imagine a sphere-shaped field that completely surrounds you). The horse’s electromagnetic field is also stronger than ours and can actually directly influence our own heart rhythm! Horses are also likely to have what science has identified as a “coherent” heart rhythm (heart rate pattern) which explains why we may “feel better” when we are around them. Studies have found that a coherent heart pattern or HRV is a robust measure of well being and consistent with emotional states of calm and joy–that is, we exhibit such patterns when we feel positive emotions. Good to know and to contemplate! Whether you are someone who wants to know “why” or are just happy to experience the “good vibes”, it’s clear that horses are a positive and healing force for those who love them.